This page explores our connection to our 'distant' cousins. William Henry Brandenburg (aka Wilhelm Heinrich Brandenburg) was born in 1722 in Brandenburg, Prussia. He sailed to America in 1752 with his wife Anna (maiden name unknown), and settled in Frederick County, Maryland. Our immediate family is descended from them. Here is our family's line through seven generations. Our direct ancestors are shown in red. William Henry Brandenburg (Wilhelm Heinrich Brandenburg) was born 1722. He and Anna have six sons and three daughters. The daughters are: Elizabeth, Anna Maria, and Eve Catherine. The sons are: Aaron, Henry, John, Mathias, Samuel, and William (b. 26 Sep 1757, d. 17 Aug 1834). William (the son, born 1757) married Catharine Bussard. They have three sons: Henry, Samuel, and William (born 1785). William (the grandson, born 1785) married Catherine Long. (She is also known as "Katy" and "Kitty" Long.) Their daughter is: Mary Ann Brandenburg (b. 17 Apr 1815 in Frederick County, Maryland; d. 8 Feb 1892). Mary Ann Brandenburg married John Shore (b. 1802 in Warminster, Wiltshire, England; d. 07 Mar 1861). Married 14 Feb 1838 (Valentine's Day) in Erie County, Ohio. ... Their children are Althea Sedale Shore, Sarah Amanda Shore, Louisa Cedelia Shore, and William Thomas Shore (b. 16 Apr 1846, d. 18 Oct 1898). William Thomas Shore married Ianthe Talbott on 05 Oct 1873. Ianthe was born in White Cloud, Nodaway County, Missouri about 1856, and died on 01 Feb 1880. She is a daughter of Perry Hoshor Talbott (b. 05 Feb 1827 in Fairfield County, Ohio; d. 19 Sep 1880 in Nodaway County, Missouri) and Isabel 'Belle' (McFarland) Talbott (b. 02 Mar 1833 in Richland County, Ohio, d. 30 Jan 1910 in Rice County, Minnesota). ... The children of William Thomas Shore and Ianthe (Talbott) Shore are Albertus Arthur Shore, and Jesse Perry Shore (b. 31 Mar 1877 in La Fayette, Illinois, d. 19 Aug 1950 in San Antonio, Texas). Jesse Perry Shore married Anna Agnes Gaffney (b. 07 Feb 1872 in Refugio, Texas, d. 07 Feb 1946 in San Antonio, Texas). Anna Agnes is a daughter of James Owen Gaffney (b. 28 Dec 1839, Victoria, Texas) and Margaret O'Reilly (b. 19 Nov 1850, Wolverhampton, England). ... Frances Shore (b. 17 Sep 1916, d. 1 Jan 1923). ... Carl Thomas Green (b. 17 Sep 1943). All of our family is descended from the generations above. Our family's direct line is descended from the generations above. The rest of this page explores our connection to our cousins. Today, we might be closer than ever before. In 1752, Mathias sailed with his brother Wilhelm Heinrich for America aboard the vessel "Two Brothers", settling at first in Middlesex, New Jersey and then moving near Hagerstown, Frederick County, Maryland. The two brothers settled in the Middletown Valley, Frederick County, Maryland. Fourteen years later their brother Jacob Brandenburg, and probably also Johannes Martin (John Martin) Brandenburg, sailed aboard the vessel "Sally" in 1766, landing in Philadelphia, Pennsylvania. Jacob settled on a farm in the New Market district called "Chance" in the wilderness of Frederick county, Maryland. Johannes settled at Oaklands Plantation in Orangeburg Co, SC. A family Bible record shows Aaron Brandenburg was born on 18 February 1761. He married his cousin Ann 'Nancy' Brandenburg who was born in 1766. They were married in Maryland. They had fourteen children, shown in their family records. Their first child is Samuel, born 1784. A 1939 application for a Sons of the American Revolution membership lists the applicant's great-grandfather as "Samuel Brandenburg" born 1784 and married to "Polly Baer" in 1818. 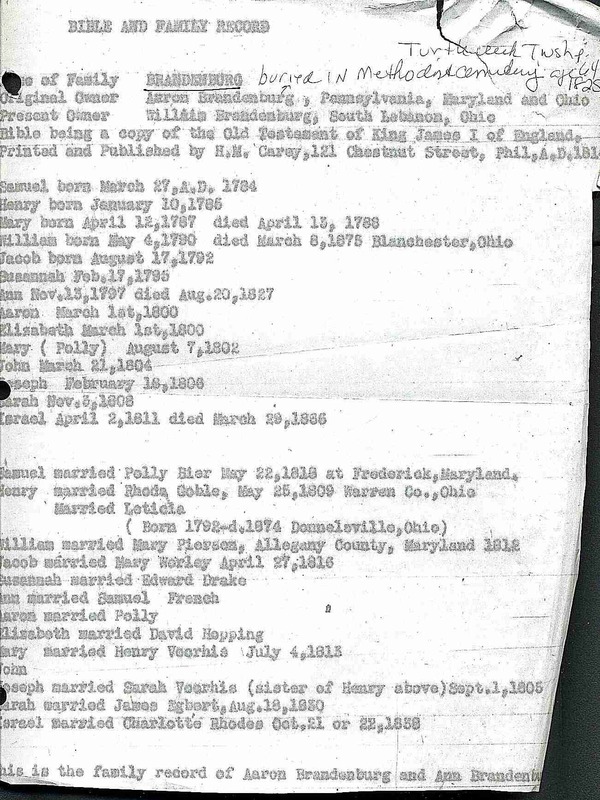 It lists the applicant's great-great-grandparents (Samuel's parents) as "William Brandenburg" (born 1758) and "Nancy Buzzard" (born 1766). Those names are in error. 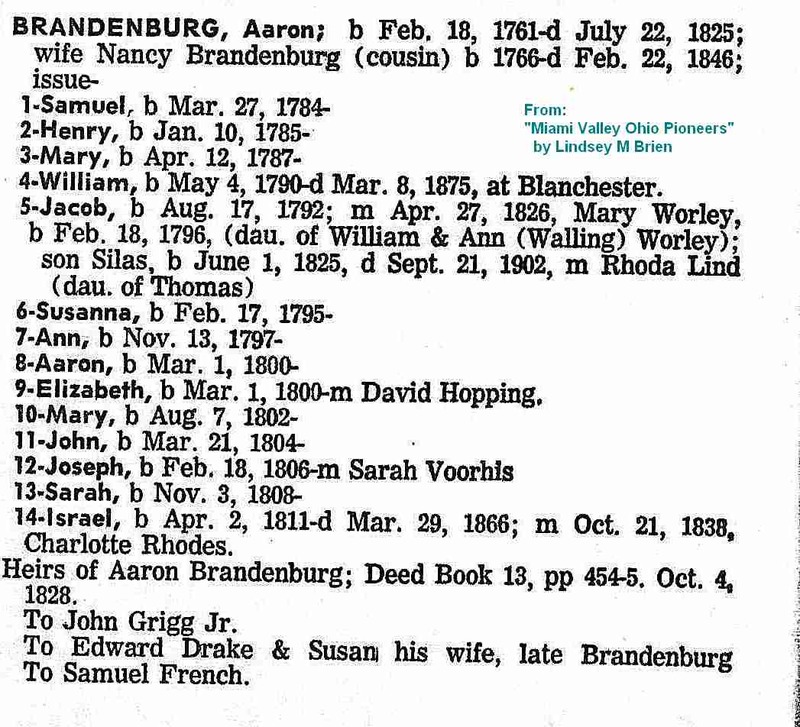 Samuel's parents are Aaron (born 1761) and Ann 'Nancy' Brandenburg (born 1766), as shown in the Family Bible record above. The Family Bible record also shows Samuel's marriage to "Polly Bier" in 1818. With the ending of the French and Indian Wars in 1763, people began to look westward to the Ohio Valley as an open and promising area to settle. Following the gaining of Independence, and partly to finance the debt from the war, the new Federal government opened those lands for sale and settlement for the increasing United States population (the first US Federal Census in 1790 records 4,000,000 people in the new country). Migration to the Ohio Valley, then called the "west", accelerated with the Louisiana Purchase in 1803. By 1820 those fertile lands were becoming home to families resettling from Maryland, Pennsylvania, Virginia and Kentucky as well as for families newly arrived from Europe. Samuel Brandenburg was one of those early settlers. 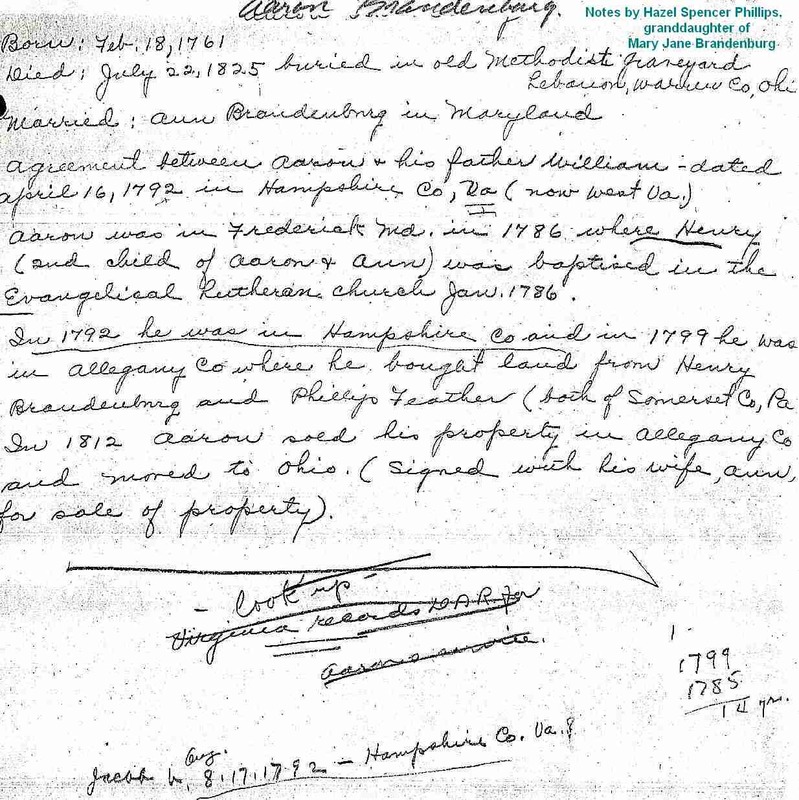 Records below show two deeds to lands in Ohio that he purchased from the Federal government in 1835.